In 20LZ, Justice Mustache was born. He was the child of John Madden and the Disco Dancer from Klik and Play. He was always interested in Super Heroes. Mainly because of his urge to blow crap up. He had a thing for JUSTICE too. You can probably guess where this leads to. you've encountered. Shouldn't you do some more violent work if you're going to do that?" Said his police officer Bobby. After moving to the S.W.A.T. team, Justice Mustache decided to take on criminals himself rather than the help of the team. For that, he was nicknamed "Justice Mustache" because of his HIGH-OCTAINE ACTION ACTS OF JUSTICE and his huge mustache. One day, Justice Mustache was taking on Justice Judge, a later rival of his, and was severley hurt. He had to be brought to a medic. Though, beyond his knowledge, this wasn't an ordinary medic. health and IMPLANTED AN ACTIVE OBJECT LAUNCHER IN HIS MUSTACHE, thus increasing the importance of J.M. 's nickname more. Dispite the stupidity of the idea, Justice Mustache found this upgrade quite helpful, albeit a bit stupid. He grew more used to it as the years passed. In 20XZ, Justice Mustache encounters his now-rival Justice Judge in a one-on-one battle in front of the Fantasy Boarder after encountering 5 other criminals. (aka J.M. 2.) After Justice Judge is defeated, UBOA emerges from nowhere and challenges JUSTICE MUSTACHE TO A FIGHTINGS. In 20YC, Evilicious, a company OF EVIL (Captian Obvious to the rescue) was created by Yume Nikki protagonist Madotsuki. Backstory for her, she had weird dreams, sent Uboa after Justice Mustace, BACKSTORY FOR HER DONE THE END. Reason why she started it? Because I'm too huge of a Yume Nikki fanboy to explain why. In 20YF, Justice Mustache learns of Evilicious after defeating an evil Alladin. Justice Mustache goes and persues Evilicious and shut them down. 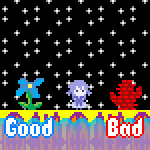 After fighting 3 awful filler bosses made after Smedis2 had a wrist cramp, He encounters Madotsuki and BLOWS HER OUT OF THE WINDOW. After defeating Madotsuki, he walks home to enjoy tea and chips. What shall happen next? NOBODY KNOWS.